The Kentucky Wildcatswill lose their top seven scorers -- Karl-Anthony Towns, Willie Cauley-Stein, Devin Booker, Trey Lyles, Dakari Johnson,Andrew Harrison and Aaron Harrison -- to the NBA draft from the team that won 38 straight games before losing in the national semifinals. 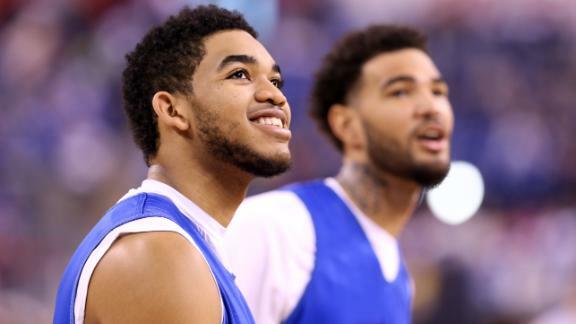 Towns and Cauley-Stein are both considered lottery picks by NBA executives. Towns is likely to go either first or second overall, along with Duke freshmanJahlil Okafor-- who also declared for the draft Thursday. Booker, a freshman shooting guard, is also considered a likely lottery pick after shooting 41 percent from beyond the arc this season. Lyles, a skilled 6-foot-9 forward, averaged 8.7 points and 5.2 rebounds in 23 minutes per game. According to several NBA executives, Lyles will likely be chosen somewhere in the 15-25 range. The 6-11 Johnson is also leaving despite averaging just 6.4 points and 4.6 boards in 16.3 minutes per contest as a sophomore. Johnson, according to NBA guys, is projected as a fringe first-rounder. Andrew and Aaron Harrison, who arrived at Kentucky as McDonald's All Americans and projected one-and-dones, have decided to leave after their sophomore campaigns. Aaron led the team in scoring at 11 points per game while Andrew averaged 9.3 points and led the team in assists. After ESPN.com consulted more than 10 NBA executives regarding their draft stock, the consensus was that the twins will both likely be selected somewhere in the second round. The NBA draft is June 25. The losses account for 85 percent of Kentucky's scoring from this past season and 77 percent of its rebounding. "If Alex Poythress doesn't get hurt, it would've been eight," coach John Calipari said, referring to the junior forward who sustained a season-ending torn knee ligament in December. The only key players returning for Kentucky will be freshman point guard Tyler Ulis,athletic forward Marcus Leeand possiblyPoythress, who is still weighing his options, according to Calipari. Ulis should step into the starting role, but Lee's role is up in the air with another strong recruiting class coming into Lexington. Calipari and his staff already have commitments from three top-50 players in the ESPN 100 rankings: skilled big man Skal Labissiere (ranked No. 3), point guard Isaiah Briscoe (No. 13) and wing Charles Matthews (No. 42). The Wildcats are also still in the mix for several remaining top prospects who have yet to make their decisions, including scoring guard Malik Newman (No. 4), big man Cheick Diallo (No. 11) and smooth wing Brandon Ingram (No. 12). Seven of the top players in the Class of 2015 have yet to make their decisions. Andy Katz reacts to the news that Kentucky will lose its top seven scorers to the NBA draft.